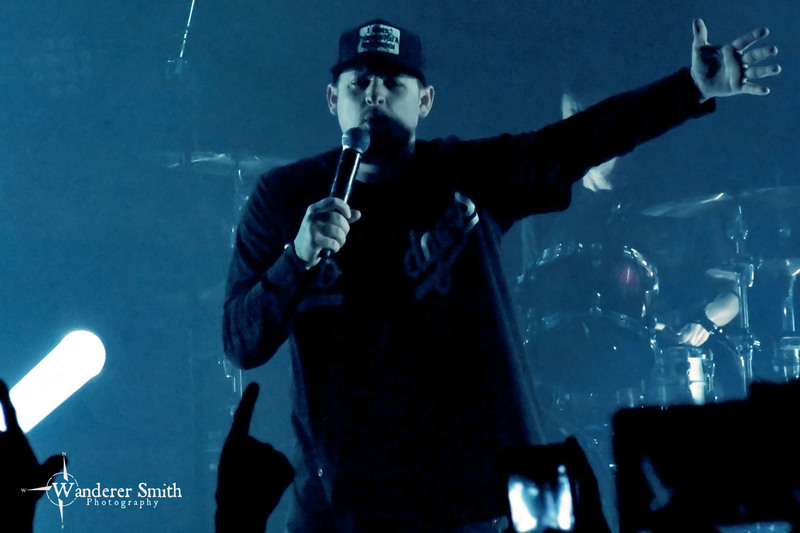 On Sunday night, Good Charlotte made their triumphant return to Dallas in support of their most recent release, Generation Rx. The seasoned pop-punk rockers, were out to prove that they could still entertain fans just as they have for over 20 years. The crowd consisted of mainly school kids attending their first Good Charlotte show or millennial’s reliving their high school years. The younger crowd flocked to the front of the stage leaving free reign of the bars for the older generation during the supporting acts. The clock struck 9:30 and Good Charlotte took the stage, right on schedule. The lights dimmed and a backdrop appeared that displayed the painted faces of the members as the title track “Generation Rx” played as an intro. The Madden Brothers charged the stage as the band began the set with “The Anthem” from their 2002 release The Young and the Hopeless. It was obvious that the kids in the crowd did their homework as they screeched along to every word of every song. Guitarist Benji Madden and brother Joel Madden (vocals) took turns giving thanks to the crowd and introducing songs throughout the set. The band explained their love for Texas and shared their appreciation to those who have served the country, as this was a Veterans Day show. Joel explained that as the band played songs from past years, he wanted the fans to think of memories from the times that the songs and albums were released. Good Charlotte @ House of Blues, Dallas, TX. Photo by Corey Smith. Smoke cannons lining the front of the stage blasted steam into the air as the band charged forward with “Girls and Boys” and “Predictable.” A handful of kids gave crowd surfing a shot as they screamed at the top of their lungs. The venue was filled with beams of flashing lights that covered the stage. The sound was well mixed, but not as powerful as other House of Blues shows I’ve attended. However, the guitars of Benji and Billy Martin were balanced and the bass of Paul Thomas bled through the mix. The shear volume of the crowd singing along made up for any power that was missing from the mix. “The Little Things” from the band’s 2000 self titled release, Good Charlotte, sent the crowd into a frenzy. The fans kicked the song off by singing “ohhh oh oh oh ohhh” in unison. The set continued with “Predictable” and “Dance Floor Anthem.” The set concluded with the crowd favorite, “Lifestyles of the Rich and Famous.” Everyone in the venue jumped together as the song kicked in and cannons blasted paper streamers into the air. It was the moment that everyone had been waiting for and it showed as the sea of fans danced around. The hour and a half set had a little something for anyone who has enjoyed Good Charlotte at any point in their career.